December 17 marks the anniversary of the Wright Brothers' successful attempt to pilot their flying machine. In 1903, the Wright Brothers had developed a machine capable of sustained powered flight. Orville and Wilbur owned a shop where they ran a printing press, and later, maintained and produced bicycles. Much of their engineering experience in the shop contributed to the development of their airplane. Strictly speaking, the Wright Brothers did not invent the airplane; other pilots and engineers had been working on gliders and unmanned planes for several years. Many other claims of powered flight exist: Clement Ader in 1897, Gustave Whitehead in 1901 along with others who achieved brief 'hops' in their devices. The Wright Brothers never filed a patent for a flying machine, however. Instead, their claim to fame lies in their invention of reliable controls for their aircraft. While previous inventors had achieved brief hops, glides, or gained speed from assisting devices like trains, the Wrights' Flyer I was the first such device to achieve flight on its own, sustained it, and flew in a controlled manner. 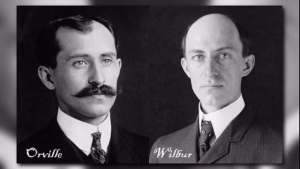 The flight of the Wright Brothers' machine officially started the pioneer era of aviation. It took several years before this achievement garnered wide acceptance in the public; despite early publication in L'Aerophile magazine and attempts by other inventors to replicate their success,recognition did not come until 1908 when Wilbur Wright brought an updated model of their aircraft to France and gave a public demonstration, flying his craft for nearly two minutes. After that, the airplane went mainstream and has not looked back since. Don't see something you like? Feel free to search our catalog for more books and movies about the Wright Brothers, airplanes, and other topics you may be interested in!